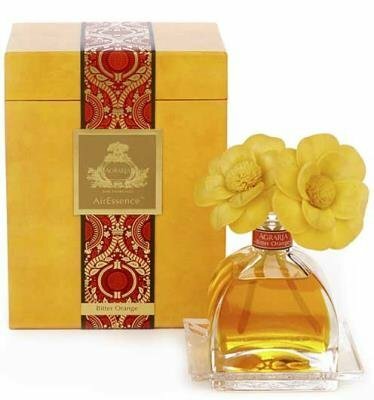 BITTER ORANGE AGRARIA Flower AirEssence Diffuser - 7.4 oz Agraira's Bitter Orange is their signature fragrance. Bitter Orange is a complex & subtle blend that permeates the air with additive waves of clove, the zest of bitter orange & just a touch of cypress. It's unique, spicy fragrance has been described by the New York Times as "uplifting, mysterious & androgynous in its appeal." Agraria's new generation of AirEssence diffuses through sola flowers - made one at a time - by skilled artisans using the dried peel of the tapioca plant that is sewn onto a cotton wick. In keeping with the Agraria definition of "from the earth", sola flowers - also referred to as balsa wood flowers - are a natural material and environmentally friendly. As the fragrant essential oils are absorbed through the cotton wick, the flower petals will change to the color of the oil as the scent diffuses into the air. Agraria Reed Diffusers have the distinct honor to be One of Oprah's Favorite Things". Agraria of San Francisco has been bringing you the finest in fragrance products since 1970. Agraria's luxury home fragrance products are available in Gump's of San Francisco, Bergdorf Goodman's in NYC!